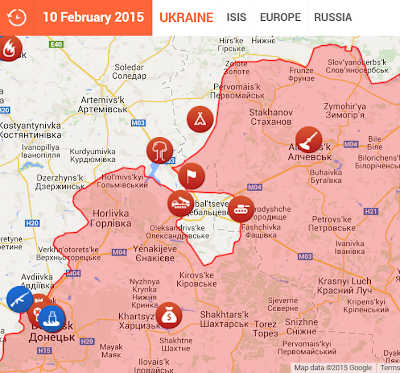 In my search for the latest military maps in Ukraine I came across this LiveUAMap purportedly from February 10. Compare the above map with the following map posted by Colonel Cassad today. The map above, just shows the cauldron (surrounded forces not all surrounding separatist held territory). Mentally line up the intersection of M103 and M104 with the same intersection in the first map. Former rebel leader Strelkov's social media page is quoting the DNR Ministry of Defense and (separately) Strelkov himself as stating that the Debaltsevo-Artemovsk road has been cut off. In other words, the lid on the cauldron has finally shut. This is generally a credible site, if you ignore the occasional crazy rumors being passed around and just focus on the overall direction of the fighting. Other posts on this site suggest that Novorossia forces are now digging in along the road, to prevent reinforcements or supplies coming into the cauldron. They are also claiming deep LNR forays into Debaltsevo itself. It's quite likely that Colonel Cassad will confirm in one of his longer posts later today. Cassad is renowned for detail and analysis, but not for breaking news. Please note, the term "cauldron" now refers to the (now-shrunken) lower half of the Kiev-held salient as per the maps you've shown. There is still a gap at the "top" that the DNR/LNR were unable to close. I must say, the degree of Ukrainian command and coordination incompetence is stunning. Kiev's forces were repeatedly taken by surprise by the direction and scope of DNR/LNR moves to shrink and cut off the salient. Reserves were also not brought to bear in time, if at all. It's clear to me that the DNR/LNR's Russian advisors have again outwitted Kiev's U.S. advisors. The second map above was posted by Colonel Cassad today (map dated yesterday), in his post Debaltsevsky Boiler. The Debaltsevsky [Debaltsevo] group is split into two parts. 5,000 are trapped in the rear boiler [cauldron]. The main problem of the junta [Ukrainian forces] is the rapid exhaustion of resources including serious problems with fuel and ammunition for heavy weapons. Yesterday the Ukraine forces retreated 4 kilometers in the Chernukhin area. Further collapse of the boiler is inevitable. In a Q&A portion following Cassad's article, Schneider Krieg (who also has his own "live" journal), pinged Cassad with his post on the "North Boiler". Cassad responded with "It depends on how much they pulled out of the boiler before the lid slammed shut. I quite agree with you, there can not be less than 4 thousand and probably closer to 5." A counteroffensive junta operation near Mariupol is more of a rather loud publicity stunt than a serious blow. The junta moved through neytralku [no man's land - contested zones] and a series of empty settlements, but in practice there were no serious attacks of the main line of defense. The reason for this attack is pending decisions of the Minsk summit. The junta is trying in the remaining time to seize control of any bit of territory they can get. Translation of these articles is difficult. About a week or so ago I reported the cauldron had closed when Cassad was actually giving his opinion that it would close. The cauldron or "boiling pot" as Cassad calls it, has indeed closed for certain as of yesterday. There are about 5,000 trapped in the rear cauldron of which 1,000 to 1,500 are support personnel. Meanwhile, Kiev denies any troops are trapped. Nothing coming from Kiev on the war is believable. Jacob Dreizin informs me there are 5,000 trapped in the lower cauldron of which 1,000 to 1,500 are support personnel. I originally stated 1,000 to 1,500 were trapped in the lower cauldron.